I realize I’ve been writing a lot about the kid this week. As the primary agent of chaos in our household he seems to be at the center of my efforts to declutter and organize. Today: the toys. We try to keep his toys simple and streamlined, and yet still they multiply. My strategy thus far has been to keep them corralled in baskets and bins, but as more experienced parents have probably already learned that is just not going to work. I feel like he doesn’t play with most of what he’s got–probably because he’s overwhelmed by seeing them all jumbled together like that–but somehow they end up scattered all over the floor every day anyway. So I decided to conduct an experiment with the toys in his room to see if that Maria Montessori was onto something. 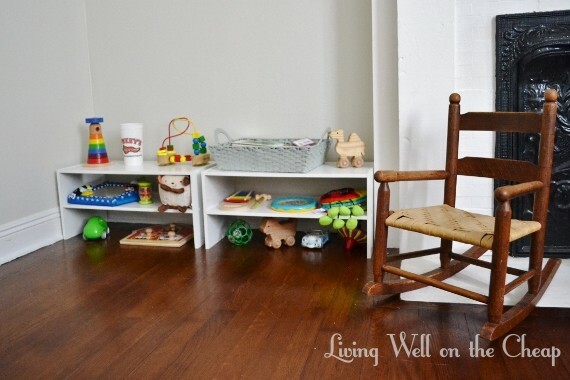 The Montessori philosophy on toys is that they should be stored on low shelves that are accessible to the child. My girl Maria believed that even babies can appreciate aesthetics and that their play areas should be orderly and attractive. 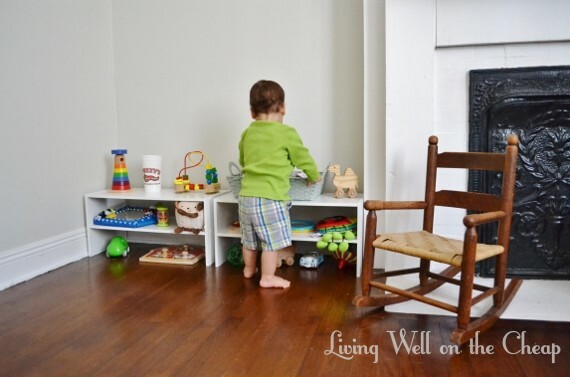 Kids should be able to see what toys are available and easily pull them out and put them away (uhhhh, we’re still working on putting them away). I got these low shelves for only $10 at Target! They’re not sold online, but you can see them here. They also come in a 31″ width for $13. I was originally going to stack them in his closet (they come with pegs and wall brackets to safely stack them) but they were just a smidge too wide. It’s just as well because I actually really like them in this corner that was previously filled with clutter (now neatly organized in the closet). I went around the house and chose toys that I thought would work well. They’re mostly his favorites but a few things that he hasn’t really noticed much before are there too. I was amazed at how much fit on these two small shelves! Without even crowding them I was able to fit sixteen toys (including a plastic cup from our favorite taco shop that he’s obsessed with) and a low basket full of board books. I mean, I feel like this is all the toys a kid could possibly need. All the toys strewn across the rest of the house are just lagniappe. Next I’d like to develop some system of rotating his toys so that he stays interested in what’s out, but I haven’t worked out all the logistics yet. Any ideas? Thanks for reading, y’all, and I hope you have a fabulous weekend! For storing my daughter’s toys, I use storage boxes or shelve both. 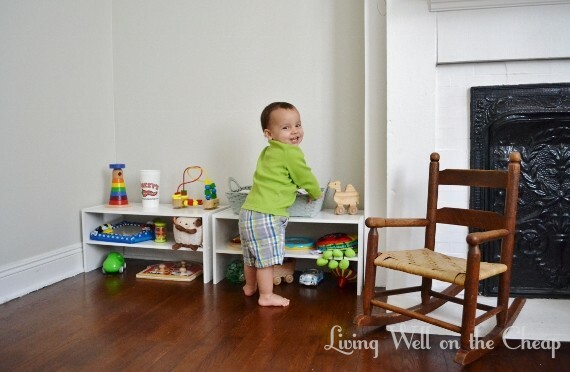 But I found these low shelves best for toys storage as child can easily access the toys. I agree. He seems to play the most with toys he can easily get to.